Even though we (Jeri and Tim) are vegetarians and a lot of the food was catered to meat-eaters (lobster, steak, seafood, etc. 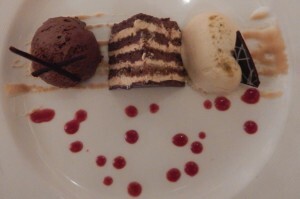 ), we still enjoyed the food very much. So here are some of our favorites. 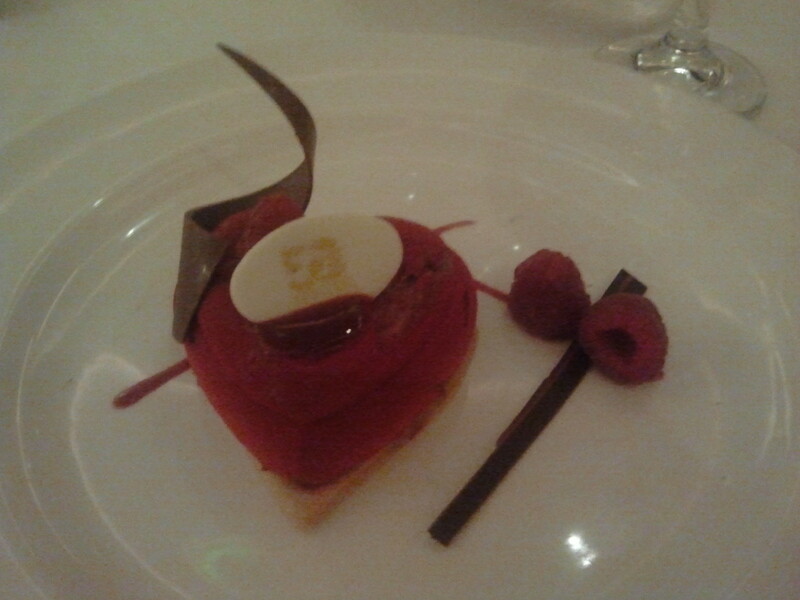 Most of the highlights were desserts. And many of those centered around chocolate. 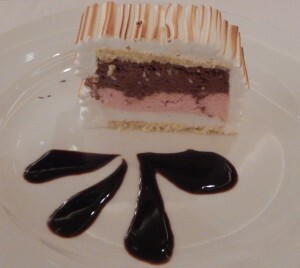 One of Jeri’s Favorite Desserts. Click photo for full size. Although it doesn’t look like much, we savored each bite of this one. Chocolate Raspberry Mouse with Vanilla Crème Brûlée and Crunchy Shortbread. Click photo for full size. 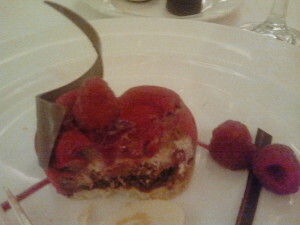 The Inside of the Chocolate Raspberry Mouse. Click photo for full size. 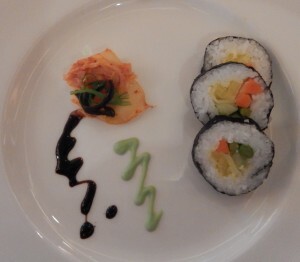 This was an appetizer, Sushi with Bacardi Wasabi Emulsion and Kimchi. Sushi with Bacardi Wasabi Emulsion and Kimchi. Click photo for full size. The dessert menu changed every night. However a few items were standard. 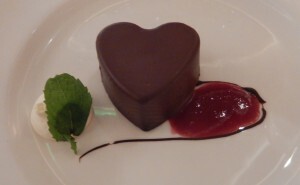 The Love Boat, Chocolate Mousse on a Chocolate Brownie, was one of the ones that was always available. The Love Boat – Chocolate Mousse on a Chocolate Brownie. Click photo for full size. 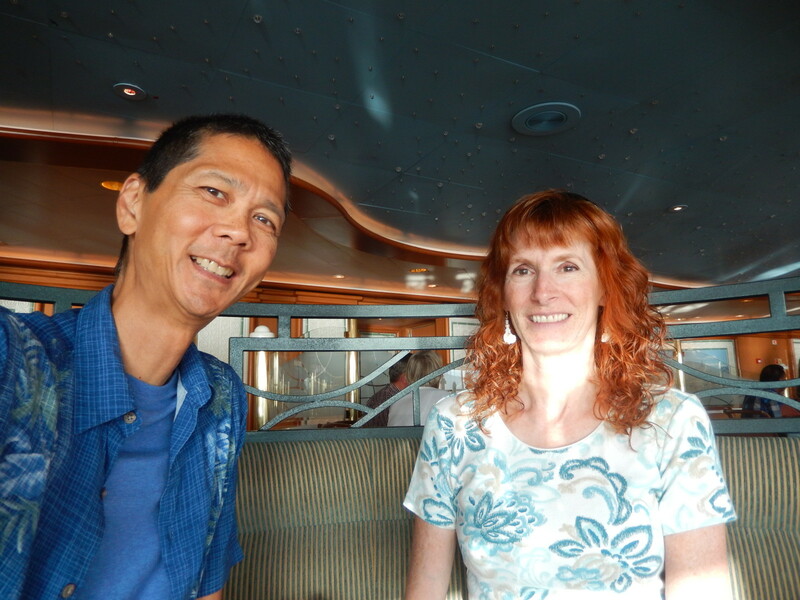 We (Jeri and Tim) are glad that we don’t have any nut allergies so we could enjoy this one. 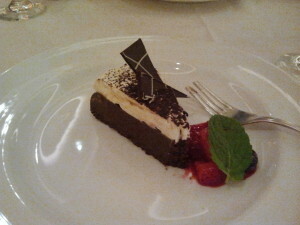 Another Chocolate Dessert. Click photo for full size. 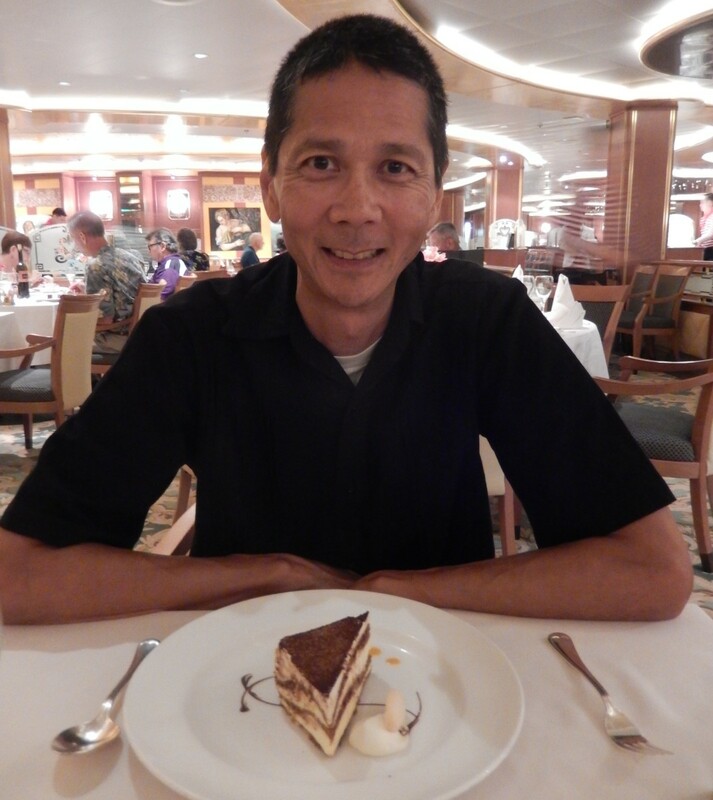 We did eat other foods besides desserts. Here we are at breakfast. Jeri at Breakfast with Her Watermelon Dress. Click photo for full size. Tim Enjoying the Breakfast Buffet. Click photo for full size. The International Cafe was open 24 hours and offered drinks (including specialty coffees) and snacks. 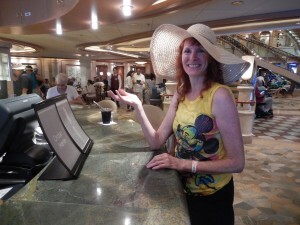 Jeri Ordering Coffee at the International Cafe. Click photo for full size. 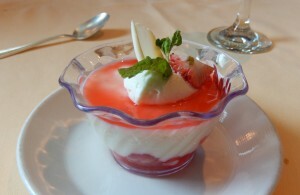 An Afternoon Snack from the International Cafe. Click photo for full size. 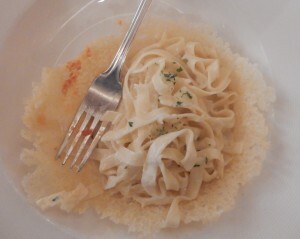 Another standard menu item was the Fettuccine Alfredo in Crisp Parmesan Basket. 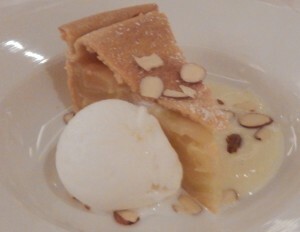 I (Tim) was afraid that the dish might contain milk and give me a stomach ache. But I was fine so they must prepare it using cream and butter (milk fat without any milk protein). 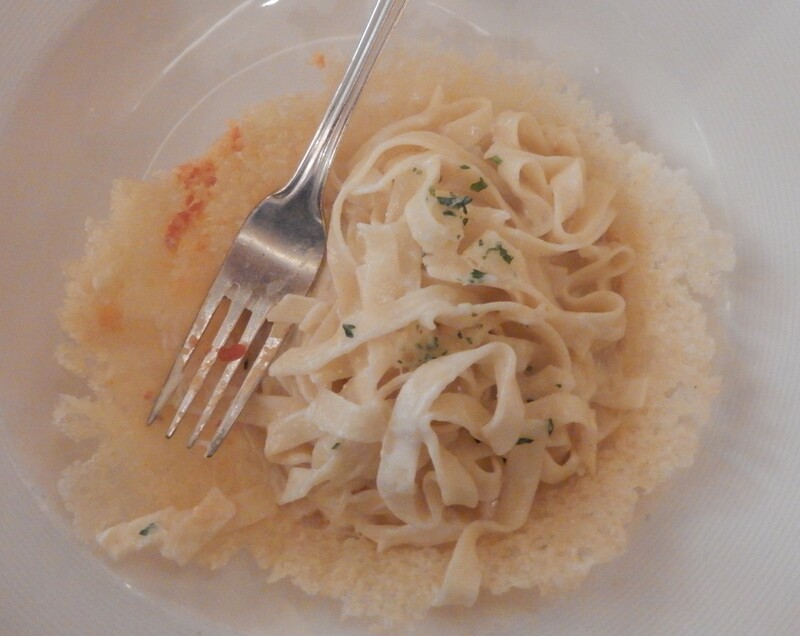 Fettuccine Alfredo in Crisp Parmesan Basket. Click photo for full size. 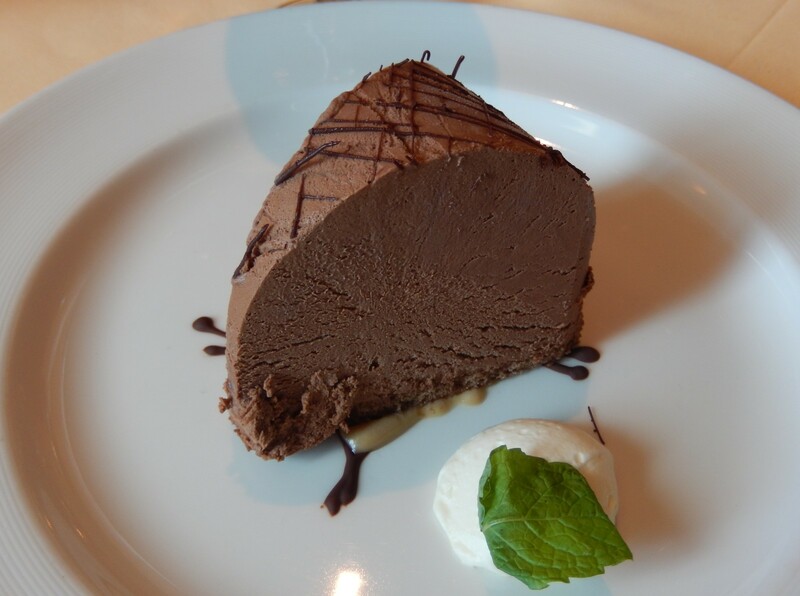 Here’s another dessert that was only available for one night: Chocolate Lovers Delight – Dark chocolate truffle mousse, tiny gateau opera, hazelnut chocolate parfait. 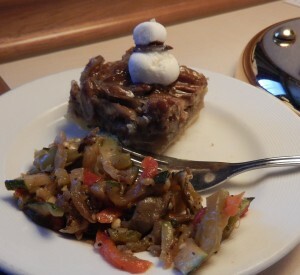 By the way, these three items were on a large dinner plate. Chocolate Lovers Delight – Dark chocolate truffle mousse, tiny gateau opera, hazelnut chocolate parfait. Click photo for full size. 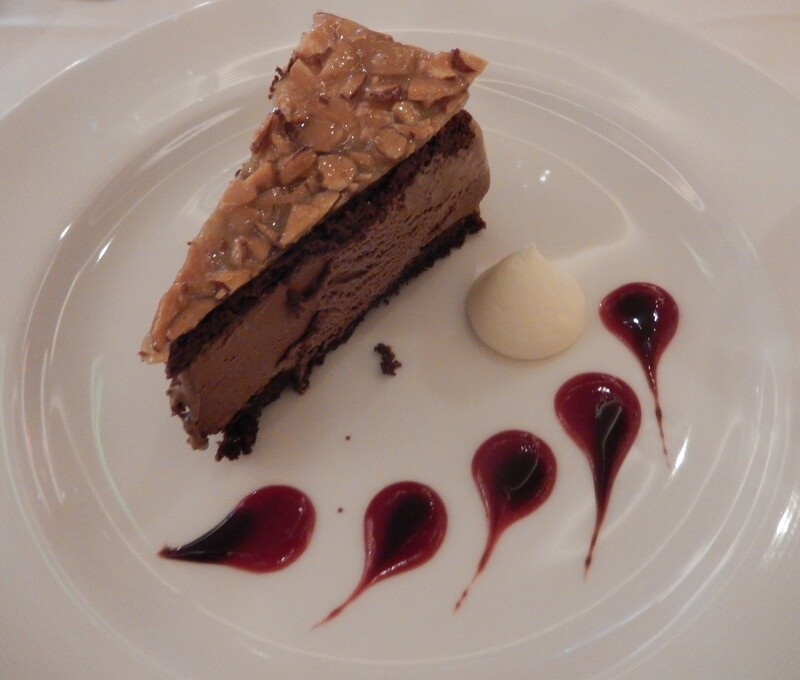 Chocolate Lovers Delight – Up Close. Click photo for full size. 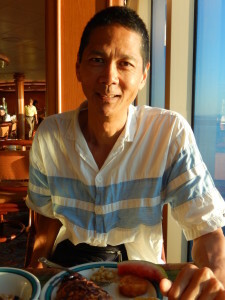 On “sea days”, we usually had lunch at one of the buffets. Jeri Sitting with Our Lunch Salads. Click photo for full size. Jeri had this for supper one night: Zucchini Ripieni Gratinati – Baked zucchini with cheese and onion stuffing, cannellini bean ragout. Jeri with Her Zucchini Ripieni Gratinati. Click photo for full size. 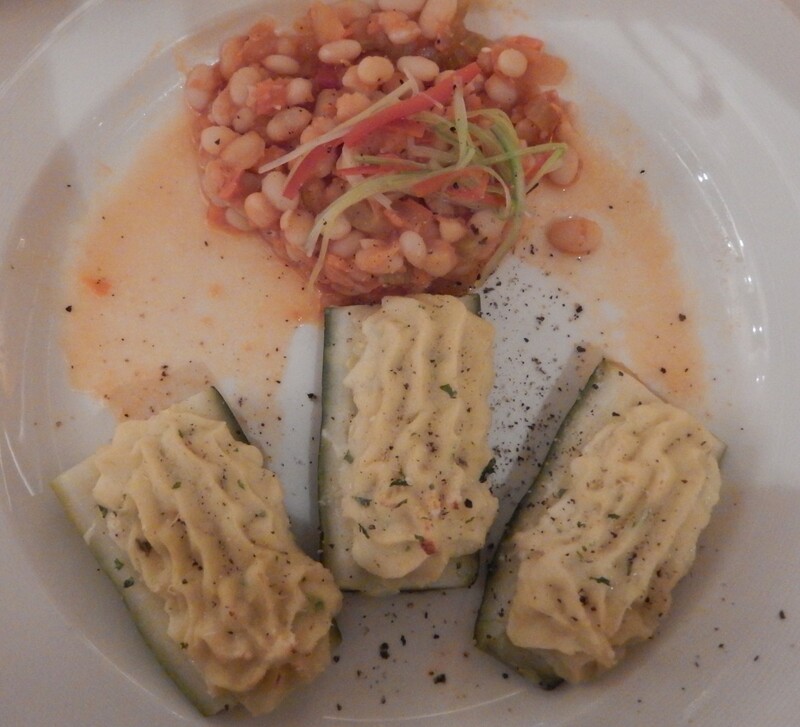 Zucchini Ripieni Gratinati – Baked zucchini with cheese and onion stuffing, cannellini bean ragout. Click photo for full size. 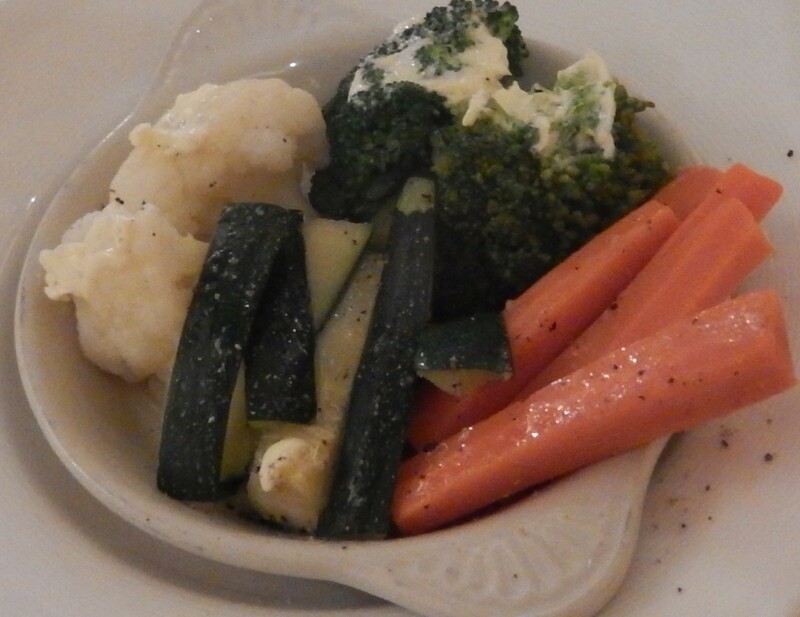 Our waiter, Gary, was kind to bring us steamed vegetables each evening. Some Steamed Vegetables. Click photo for full size. Another fabulous dessert was their Tiramisu – Espresso, zabaglione cream, bittersweet cocoa. Tim with His Tiramisu. Click photo for full size. 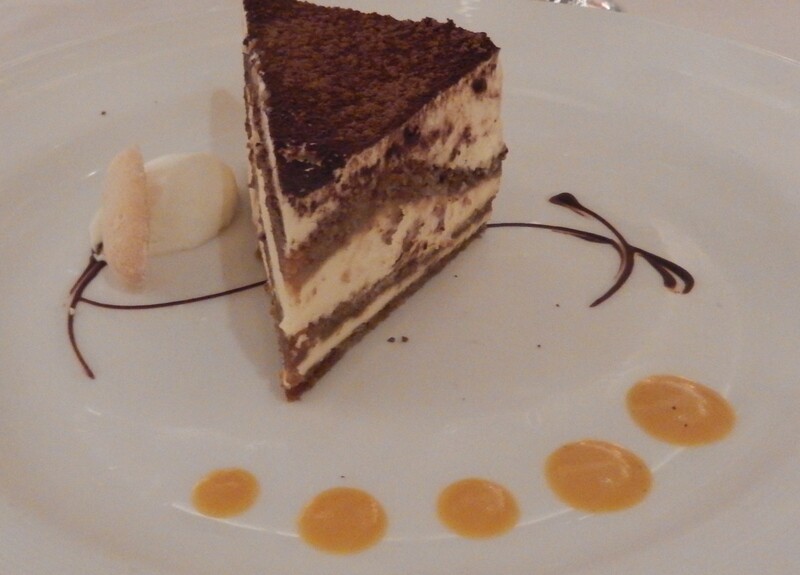 Tiramisu – Espresso, zabaglione cream, bittersweet cocoa. Click photo for full size. Here are yet again some of the dishes from another evening meal. 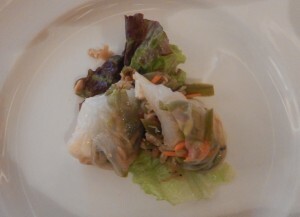 Starting with our appetizer, Thai Wraps with Cucumber and Bean Sprouts – Grilled spring onions and silky tofu in rice paper with roasted chili and rice wine vinaigrette. Thai Wraps with Cucumber and Bean Sprouts – Grilled spring onions and silky tofu in rice paper with roasted chili and rice wine vinaigrette. Click photo for full size. 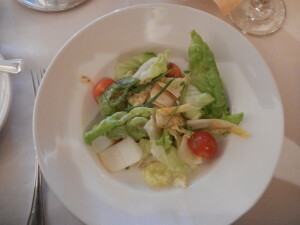 Here’s the salad: Belgian Endive, Boston Lettuce and Tomato. Belgian Endive, Boston Lettuce and Tomato. Click photo for full size. 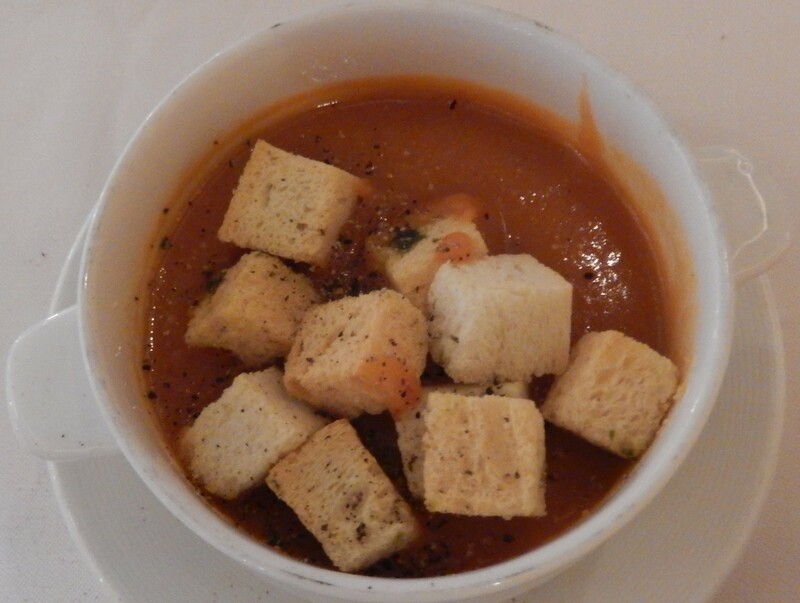 Here’s the soup: Roasted Tomato Cream Soup with brioche croutons and basil pesto swirl. Roasted Tomato Cream Soup with brioche croutons and basil pesto swirl. Click photo for full size. 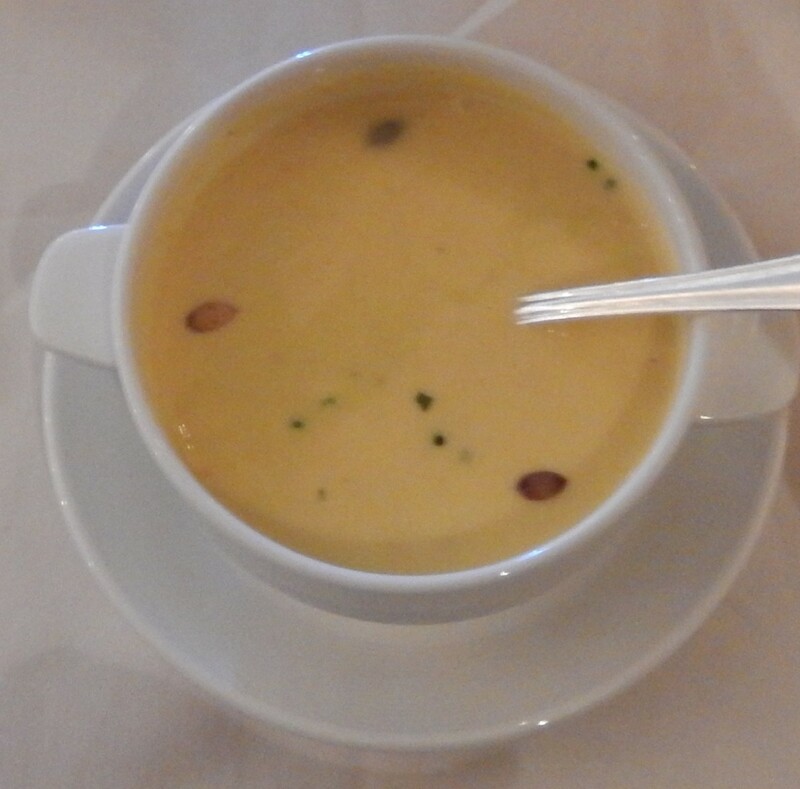 Here’s the main dish: Rollatine Ripiene con Zucca, Mascarpone e Noci – Baked crepes filled with roasted pumpkin, mascarpone and walnuts thyme-cream sauce. Rollatine Ripiene con Zucca, Mascarpone e Noci – Baked crepes filled with roasted pumpkin, mascarpone and walnuts thyme-cream sauce. Click photo for full size. One of our favorite desserts: Chocolate Pistachio Dome with Almond and Pistachio Nougatine. 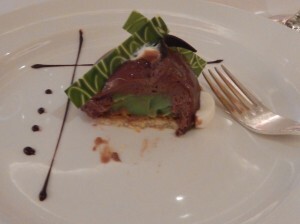 Chocolate Pistachio Dome with Almond and Pistachio Nougatine. Click photo for full size. Inside of the Chocolate Pistachio Dome. Click photo for full size. I (Tim) had a fresh veggie burger for lunch. Sorry to say this…but I think that I prefer the store-bought veggie burgers. 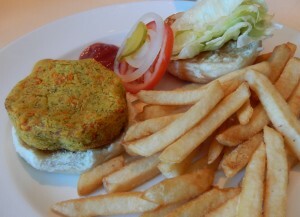 Veggie Burger with Fries. Click photo for full size. Strawberry Parfait. Click photo for full size. Our lunch dessert was Chocolate Marquise Slice with Coffee Sauce. Chocolate Marquise Slice with Coffee Sauce. Click photo for full size. 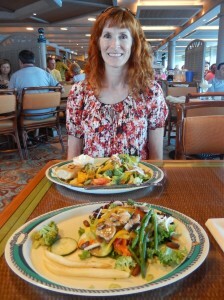 This was supper on our last night. Chilled Curried Pumpkin Cream Soup spiced with cumin, coriander and cardamon in coconut milk. Click photo for full size. 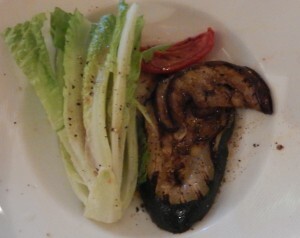 Grilled Zucchini and Eggplant with Sundried Tomatoes Chives and Hearts of Romaine. Click photo for full size. 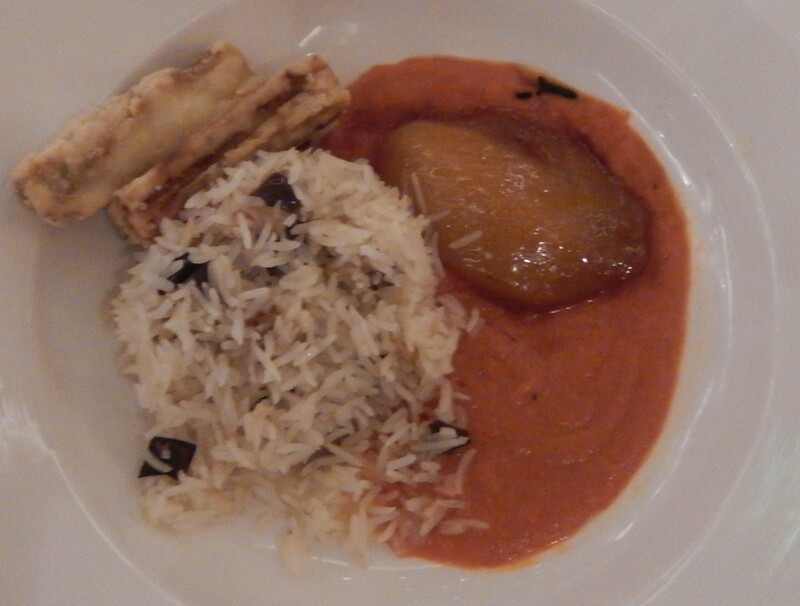 Eggplant and Basmati Rice Timbale with crisp-fried fritters, juicy mango cheek and spicy tomato sauce. Click photo for full size. 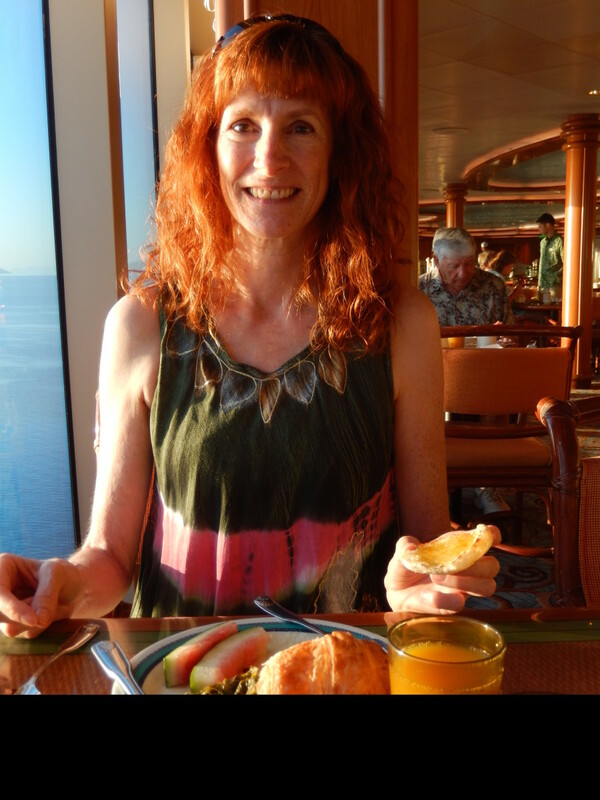 Breakfast on our last morning…just before we disembarked the ship. Breakfast – English muffin, croissant, muesli, peaches, cereal, orange juice, and soy milk. Click photo for full size. Tim and Jeri on our Last Morning. Click photo for full size. After showering and getting ready, we got a coffee for Jeri and two fruit bowls plus a chocolate croissant at the International Cafe. 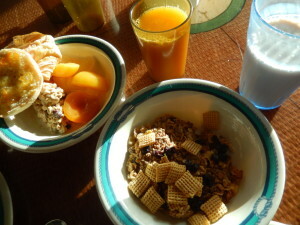 Breakfast at the International Cafe. Click photo for full size. 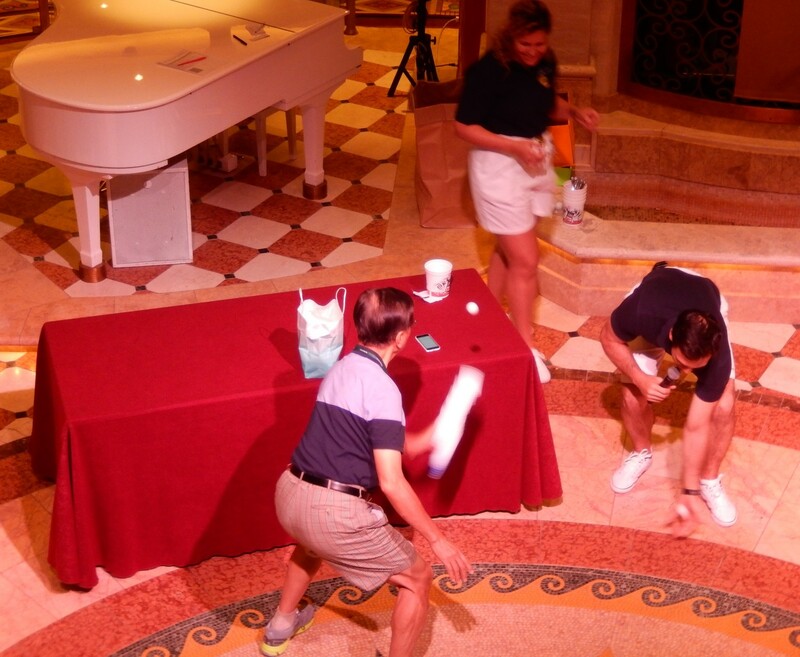 Later in the morning, we watched “The 60-Second Frenzy.” The cruise staff had fun party games with little prizes. One game was to get a balloon into a paper bag without using your arms or hands. Another was bouncing a ping pong ball into a stack of 10 cups. Each time you succeeded, however, you had to take a cup from the bottom of the stack and place it on top of the ball in the top cup. Catching Ping Pong Balls During the 60-Second Frenzy. Click photo for full size. For lunch, we had our first sit-down lunch of the cruise in the Da Vinci dining room. 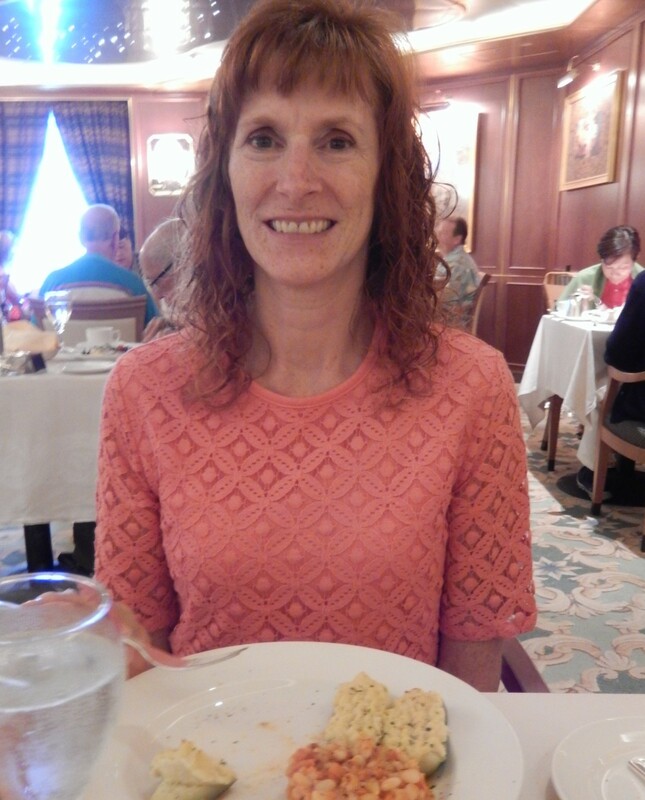 (Normally we would eat lunch at one of the buffets.) We sat at a table with two other couples. I had a veggie burger that was made from fresh vegetables. Although we started around noon, we didn’t finish until close to 1:30 PM. We ended up missing the ice carving demonstration which started at 1:00 PM. 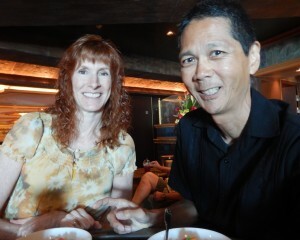 But we enjoyed lunch and visiting with others. We then rested a bit in our room. I (Tim) took a nap. Jeri got a hot drink called “Double Chocolate Mocha Madness.” We watched an episode of the “Deadliest Catch” while we began the sad process of packing up. Choir Singing Selections from the Sound of Music in the Atrium. Click photo for full size. We went down to dinner at 5:30 PM. 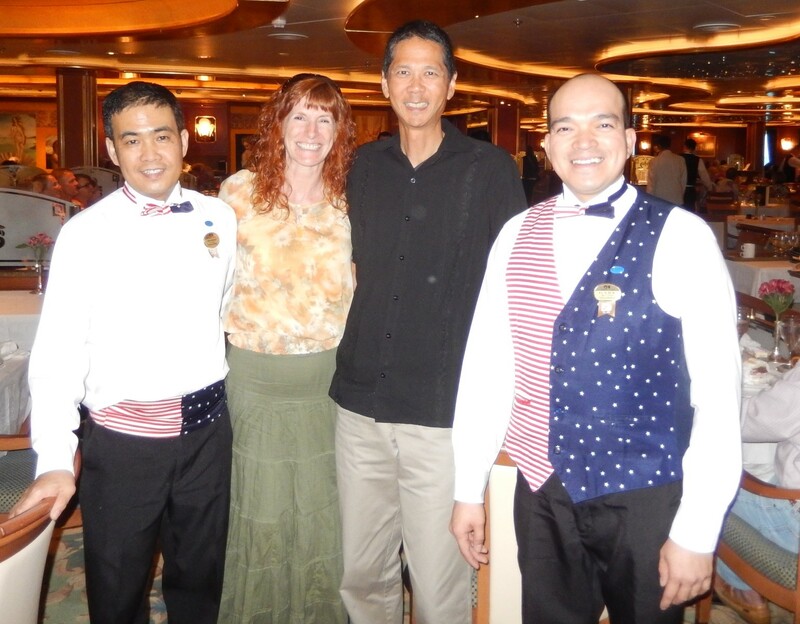 After enjoying another great meal, we got a photo with our waiters, Gary and Wilfredo, who served us supper each night during the cruise. Gary reminded us of Bob Hope–his looks plus his happy nature. Wilfredo, Jeri, Tim, and Gary after Our Final Supper. Click photo for full size. 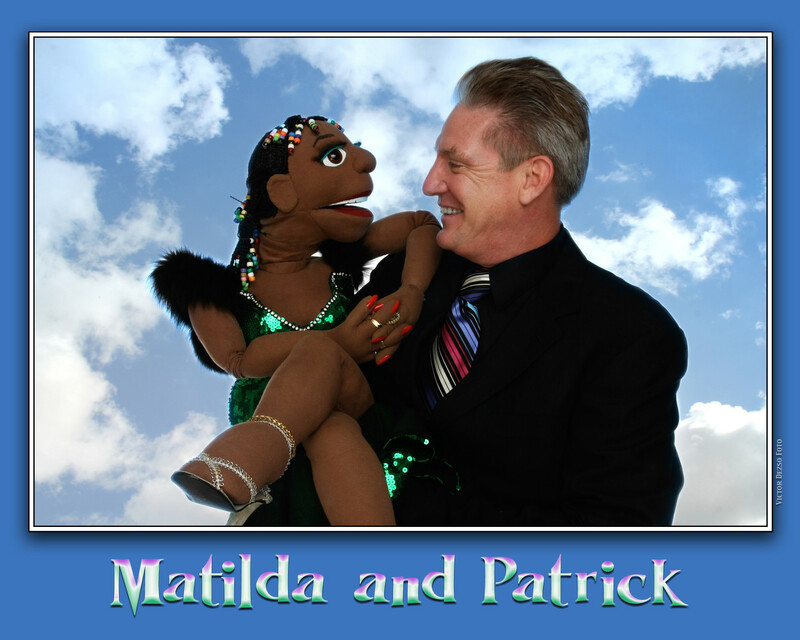 We finished the day with our last show of the cruise, “Matilda and Patrick Murray.” Patrick is a ventriloquist. 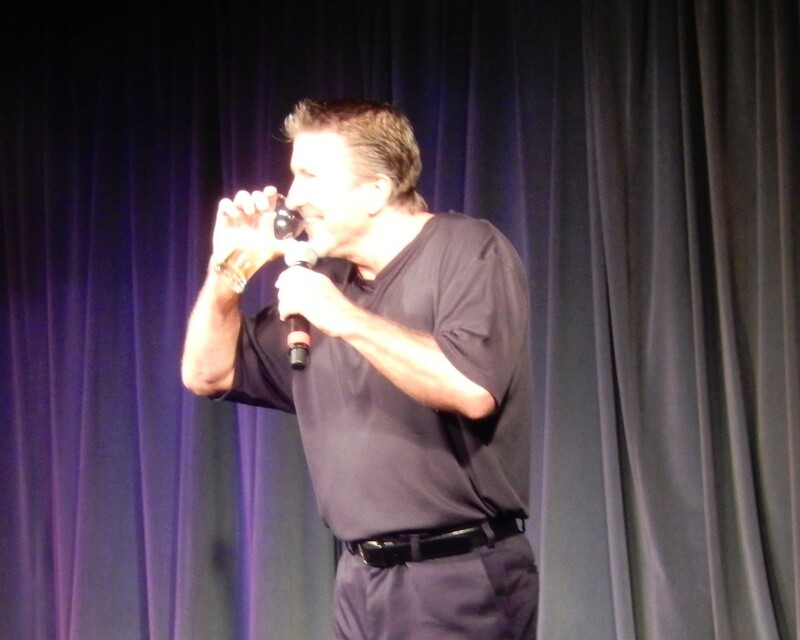 A lot of “their” jokes were about cruising and traveling. Matilda and Patrick. Click photo for full size. Tonight we visited with Darwin, our room steward. 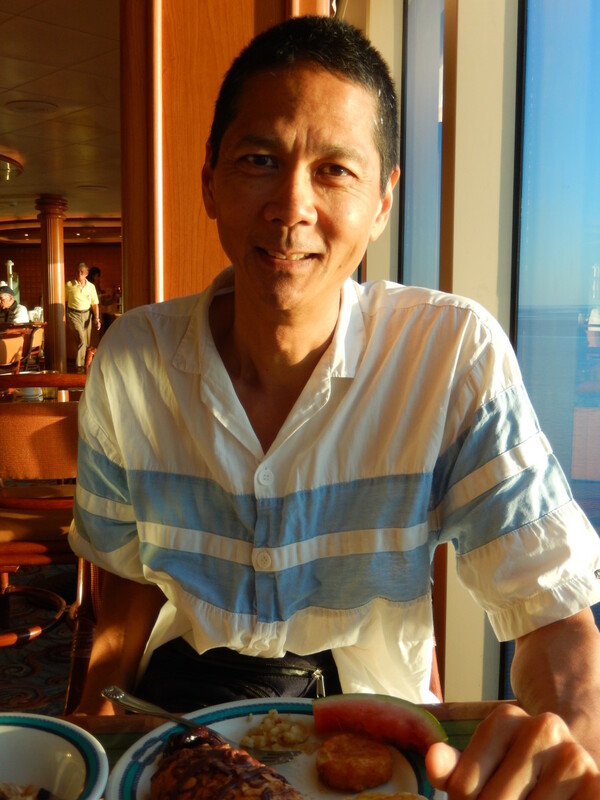 He heads back to the Philippines in a week. He has worked every day for nine straight months (the term of his contract). Now he gets three months off. He’ll go back and spend time with his young daughter. He’ll start another nine-month term in January. He has been doing this for 15 years. He’s seen the world but it is a tough life. 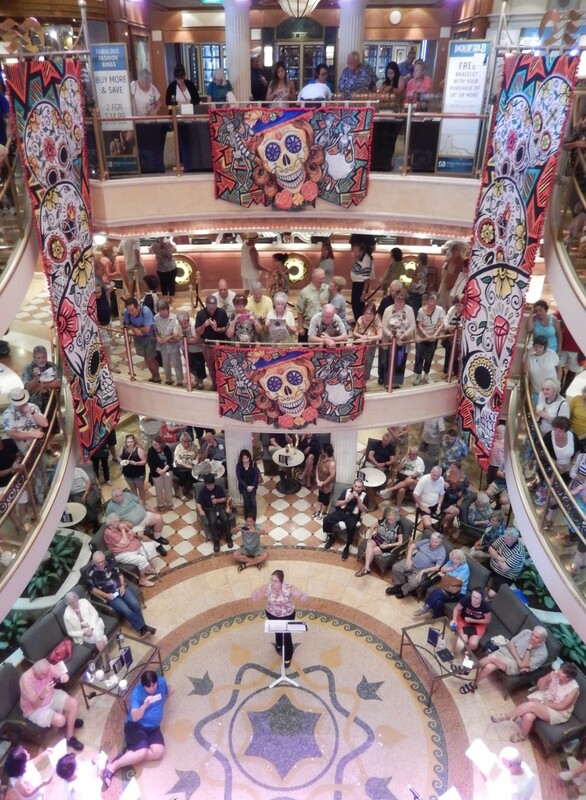 The final two days of the cruise were “sea days” (meaning that we were sailing) as we traveled back to Long Beach (called Los Angeles by Princess Cruise). 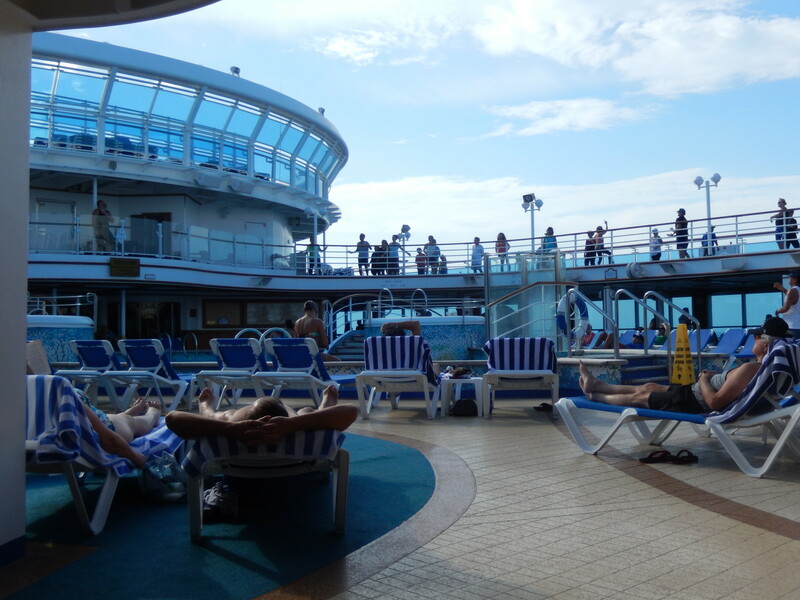 With no planned excursions, our days were much more leisurely. 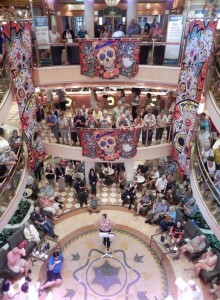 We watched some different programs on the ship including Bob, the cruise director, sharing his story. Here’s a Zumba class. Zumba Class on Top Deck. Click photo for full size. 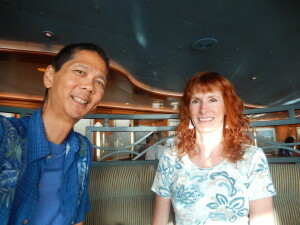 After an early lunch on Thursday, we watched the movie “Now You See Me” outside up on the top deck. I (Tim) had seen it a few years ago but I couldn’t remember the final twist in plot at the end. Jeri hadn’t seen it. So we both enjoyed watching it. 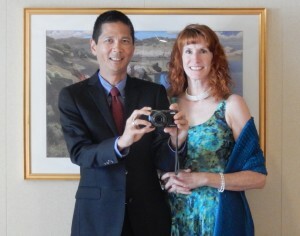 Thursday was the second of the two formal nights. So we enjoyed dressing up for a nice meal. Here we are in our room. Tim and Jeri on Second Formal Night. Click photo for full size. 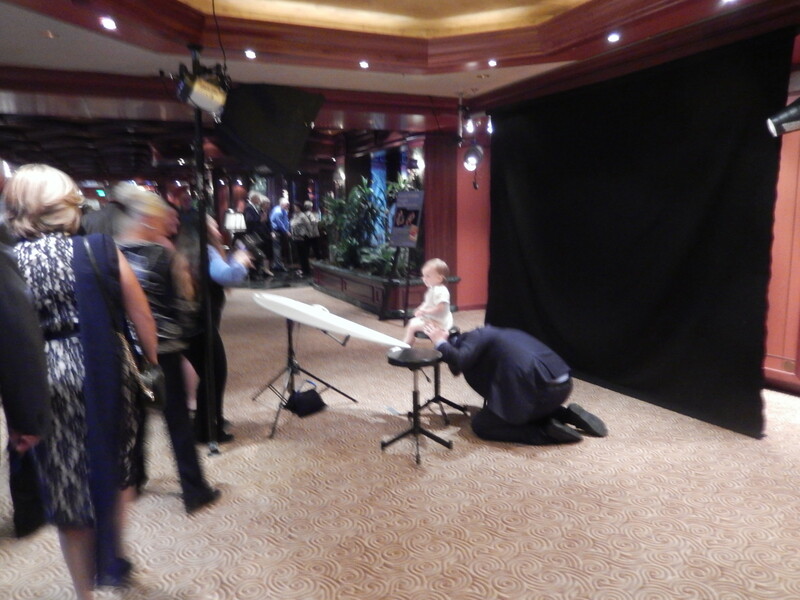 Taking a Baby’s Picture. Click photo for full size. The dessert (as always) was fantastic! 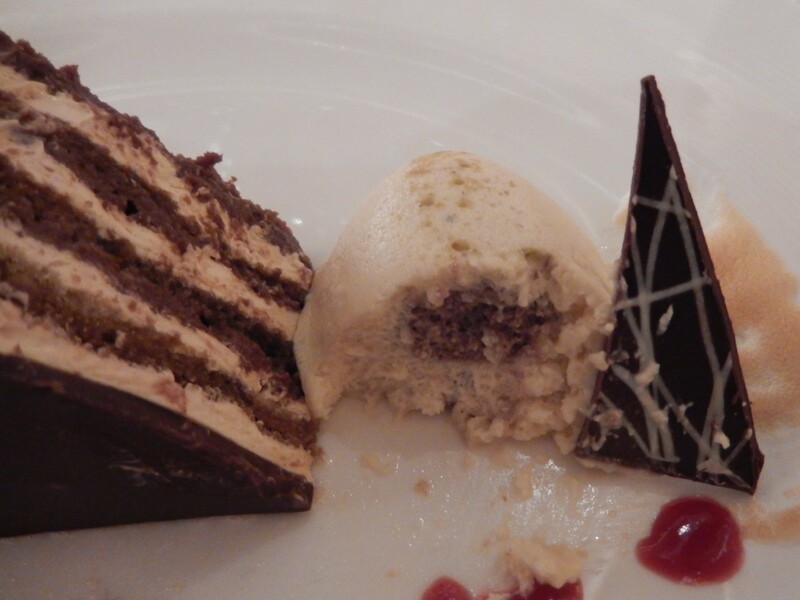 From the menu: Chocolate Pistachio Dome with Almond and Pistachio Nougatine. 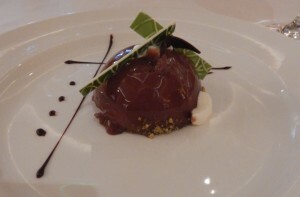 Featuring a moist almond cake, the rich Sicilian pistachio crème brulée is encased in a light bittersweet chocolate mousse that sits atop an almond pistachio crunchy nougatine, and glazed in a milk chocolate glacage. 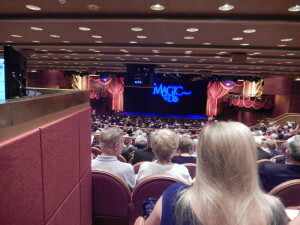 After dinner, we saw the show “Magic To Do” in the Princess Theater. The show was entertaining…mostly song and dance with some great visual effects plus some magic and illusions. Sometimes people (or even an “elephant”) would magically disappear or magically appear. We sat in the back row. In the Back of the Princess Theater. Click photo for full size. 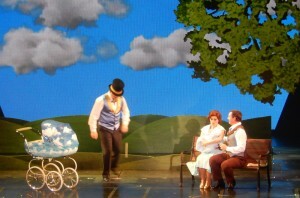 Scene from Magic To Do. Click photo for full size. 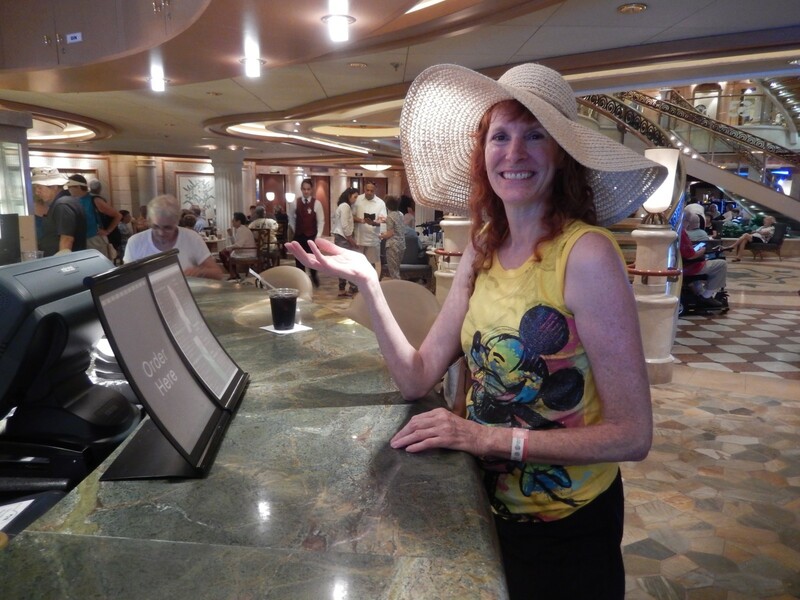 After the show, we dashed back to the Explorers Lounge. Although the 9:00 PM show would begin in just minutes, we were able to find good seats. Rollin’ Jay Moore had another funny show that had us laughing a lot. Rollin’ Jay Moore. Click photo for full size. As a side note, a retired couple sat at a table very close to ours at supper. The wife asked if we were newlyweds. When we told them that we were celebrating our 30th anniversary, the husband said that we must have gotten married when we were in kindergarten. We were flattered!